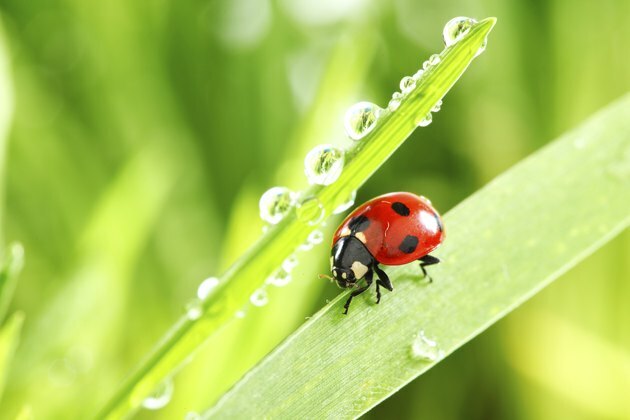 An old superstition states that it's good luck if a ladybug lands on you. Indeed, ladybugs are extremely beneficial in the garden. Indoors, however, they can become pests. The term "ladybug" usually applies to two common critters: the Asian lady beetle (Harmonia axyridis), and the European beetle (Coccinella septempunctata). Although it can be difficult to tell them apart, Asian lady beetles have an "M" shape right behind their heads. If you see any ladybugs clustered in your home, resist the urge to kill them. Instead, create a black light trap that will trap them alive, and then set them free in your garden. Ladybugs eat damaging insect pests. Use the nail and hammer to poke four evenly spaced holes around the edges of the clamp light's shade. It's easiest if you place the lamp face down on a block of wood or work table. Cut a straight line from the edge of each transparancy sheet to the sheet's center. Flip one sheet so that the cuts are at opposite ends, and then slide the solid edge of one sheet into the slit of the other sheet, forming an "X" shape. Secure with transparent tape. Place tape over each corner of the transparencies, and then punch a hole in each corner through the tape -- eight holes in all. Attach the corners of the transparencies to the holes in the clamp lamp shade using four twist ties. Set aside. Use a knife or box cutter to remove the bottom one-third of one of the clean, empty jugs. Punch four equally spaced holes in the cut edge of the jug. Remove the lids from both jugs, and use the knife to cut large holes in the center of both lids. Hot-glue the two lids back-to-back. Let them dry completely. Spray-paint both jugs and the lids black. Let them dry completely. Flip the cut jug upside down, and line up the holes with the holes in the transparencies. Attach the cut jug to the transparencies using the remaining four twist ties. Screw the glued lid onto the mouth of the cut jug, which is hanging upside-down. Screw the intact jug to the other side of the glued lid. Now you have a funnel to trap the ladybugs. Screw a 60-watt black light bulb into the lamp. Incandescent light also works, but black light works best, according to Iowa State University. Sprinkle the transparency edges and the inside of the funnel with talcum powder so that the ladybugs can't grip the surface and climb back out. Clamp the lamp to a secure place, such as the edge of a table, near where you have seen ladybugs clustering. Turn off all other lights but the black light and leave it on overnight. In the morning, unscrew the bottom jug and take the ladybugs out to your garden.